What is War Tax Resistance / WTR? With WTR we are actively resisting military spending at the moment we fill out our income tax return. At a purely technical level, this would consist of deducting from our taxes the part that is destined to be spent for military purposes. With WTR we are not encouraging or promoting some sort of “a la carte taxation” as some people believe, as though it were not being used as a tool for civil disobedience, which is to say, to disobey and to disrupt, publicly and collectively, a law or rule that is considered unjust, seeking to overcome it together (in this case, military spending and militarism). The ultimate goal of WTR is the elimination of armies, military research, and the military-industrial complex, through a progressive reduction in military spending. 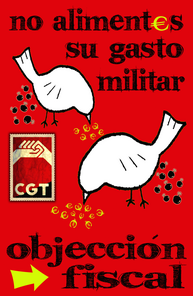 By resisting war taxes we show our collective refusal of military spending in particular and militarism in general, at the same time that we are in solidarity with other struggles taking place in our society by means of the projects we select. We are women from various countries, of different nationalities and experiences. Some have legal documents, others do not. We do domestic labor. We have certain work conditions that make us very vulnerable. The difficult conditions and fear function to isolate and separate us. For this reason we have decided to struggle together, in a real challenge to isolation and fear, as a way to make us stronger. Domestic work sustains the life of thousands of households daily, and, nevertheless, is invisible, undervalued labor. We want this to change and to be included in the Régimen General, an important step in the recognition of its value. Also that undocumented workers should have the same rights as everyone else. We cannot forget that this work is moving out of the hands of some women (those of Northern countries) to others (those of Southern countries), making the problem far from disappear, but globalize. For years in Paraguay various antimilitarist groups have been working for a demilitarized society and are supporting other struggles (peasants, human rights, the youth movement, etc.). Tax Resistance this year will be dedicated to supporting the antimilitarist movement in Paraguay and the action that War Resisters International has prepared for the May 15th International Day of Conscientious Objection , which this year focuses on the situation in Paraguay. If you thought the “dissent = treason” equation was fun when you saw it on the chalkboards during the last administration, you’ll love the new progressive remake of this timeless classic. The latest ugly incarnation of this idea comes from Melissa Harris-Lacewell at The Notion , the blog associated with the leftie magazine The Nation . I often begin my political science courses with a brief introduction to the idea of “the state.” The state is the entity that has a monopoly on the legitimate use of violence, force and coercion. If an individual travels to another country and kills its citizens, we call it terrorism. If the state does it, we call it war. If a man kills his neighbor it is murder; if the state does it is the death penalty. If an individual takes his neighbor’s money, it is theft; if the state does it, it is taxation. Still, a liberal friend of mine earnestly forwarded a link to this article to his friends, solemnly remarking: “Indeed, the Tea Partiers are dancing right around the borderline of sedition. They’re objecting to the lawful authority of the state.” If only they would!